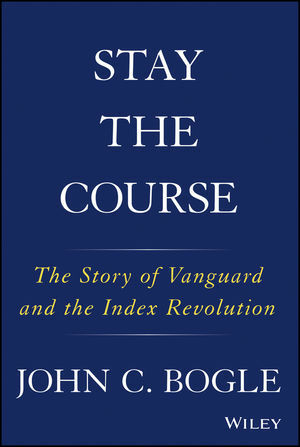 Stay the Course is the story the Vanguard Group as told by its founder, legendary investor John C. Bogle. This engrossing book traces the history of Vanguard—the largest mutual fund organization on earth. Offering the world’s first index mutual fund in 1976, John Bogle led Vanguard from a $1.4 billion firm with a staff of 28 to a global company of 16,000 employees and with more than $5 trillion in assets under management. An engaging blend of company history, investment perspective, and personal memoir, this book provides a fascinating look into the mind of an extraordinary man and the company he created. The Vanguard Group and John Bogle are inextricably linked—it would be impossible to tell one story without the other. Stay the Course: The Story of Vanguard and the Index Revolution weaves these stories together taking you on a journey through the history of one revolutionary company and one remarkable man. Investors, wealth managers, financial advisors, business leaders, and those who enjoy a good story, will find this book as informative and unique as its author. JOHN C. BOGLE is the founder and former CEO of The Vanguard Group and the world's first index mutual fund. A graduate of Blair Academy and Princeton University, he has spent his entire career in the mutual fund industry67 years (and counting). Stay the Course is Mr. Bogle's twelfth book, a string that began with Bogle on Mutual Funds (1993). Subsequent books include: Common Sense on Mutual Funds (1999, updated 2010), The Battle for the Soul of Capitalism (2005), Enough. (2008), and The Little Book of Common Sense Investing (2007) and its 10th Anniversary Edition (2017). A prolific writer for the investment profession, Mr. Bogle has had 28 of his papers published in the The Financial Analysts Journal and The Journal of Portfolio Management. In 1998, CFA (Chartered Financial Analysts) Institute presented Bogle with its highest homage, the Award for Professional Excellence. For his extraordinary lifetime achievements in serving investors, Bogle has received honorary doctorate degrees from 13 universities, including Princeton, Georgetown, Delaware, Villanova, and Trinity. In 2004, TIME magazine named him as one of "the world's 100 most influential people." Despite a devastating setback in his career in 1974, and frequent serious health challenges (he received a heart transplant in 1996), John Bogle remains fully active in his career and with his familywife Eve, six children, twelve grandchildren, and (so far) six great-grandchildren. His advice to his family is the same as his advice to investors, entrepreneurs, and readers of this book: "In good times and bad times alike, Stay the Course."